Our companion services program is perfect for seniors who just need a little assistance. As everyday activities such as driving, cooking, and grocery shopping become more challenging, many seniors are enjoying the private convenience of an in-home TLC assistant. We are there when you need us. Our non-medical assistants are like having your own personal driver who can also cook, prepare a luncheon for you and a friend, shop for a grandchild’s birthday and remind you when to take medicine. Ease your burden and improve your loved one's daily experience by providing them with a little extra assistance and companionship. Many families experience remarkable improvement in the mood and well-being of their elderly family members when an extra friend is available to tend to their needs and keep them company. What can I expect to pay for a senior companion caregiver? Our companions are available full-time, part-time or as-needed Rates depend on level of care needed and duties requested. 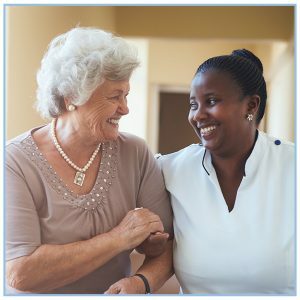 Senior companion caregiver salaries vary based on experience, training, and services needed. Caregivers make between $15-$25 per hour with most receiving $15-$20. For live-in care providers, you can expect to pay $600 per week. Please let us know the details about your needs. Describe how we can help with a companion for your loved one. Please include days of week and hours that you would like the companion to attend to your loved one.